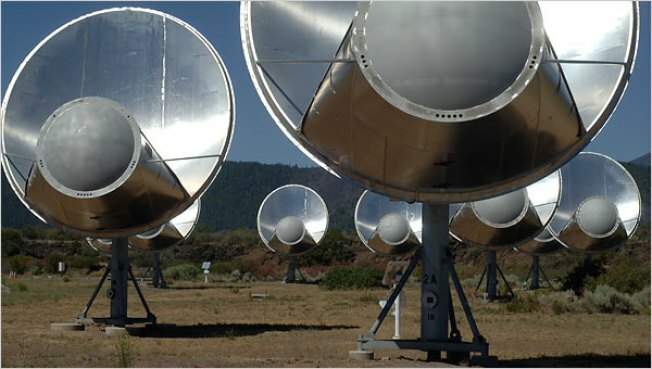 Due to lack of funding, the SETI Array has been put into hibernation. Don’t roll out the welcome mat for the extraterrestrials just yet, say Bay Area researchers responding to a report that a Russian team detected a radio signal from a star 94 light years away. SETI researchers believe the signal was interference, not a radio transmission from an advanced civilization on a distant planet. The news reached the Berkeley SETI Research Center team during their regular Friday afternoon meeting in the form of a PowerPoint presentation, said the center’s director Andrew Siemion. "The email popped into our inboxes and in the middle of our meeting we started going through the slides" which documented the unusually strong radio signal detected by the RATAN-600 telescope, Siemion said. His team used their regularly scheduled telescope time with the Green Bank telescope in remote West Virginia to follow up on the signal, which came from HD 164595, a solar system 94 light years away from Earth with at least one Neptune-like planet. "We worked on it Friday evening into Saturday. We had to figure out how to make the Green Bank telescope to mimic what the Russians had done,” Siemion said. "It was an exciting moment, but we had to read between the lines. It wasn’t a scientific paper so we had to figure out what they had done." At the SETI Institute in Mountain View, Seth Shostak’s team also aimed their telescope, the Allen Telescope Array in rural Lassen County, at HD 164595 on Saturday. "I wasn’t terribly hopeful. False alarms come with the territory. We’ve had them before and they’ve been more convincing than this," Shostak said. "It’s just good science that if you find a signal, you want to check it out." But no dice. Siemion and his team published their findings in a short paper, while Shostak wrote on the SETI Institute website that the signal was "interesting," but most likely caused by terrestrial interference. In an online forum, Eric Korpela, another Berkeley astronomer, questioned whether the signal was even from HD 164595. Siemion dreams of celebrating the detection of extraterrestrial intelligent life, but the bottle of bubbly he keeps at the lab remained corked this weekend. "It’s actually cava. We’re not ritzy enough to have real champagne. The team was skeptical,” he said. “When we see something interesting in astronomy, the first idea we have is NOT that it’s ET intelligence. We thought it was a remote possibility that it was a celestial signal at all." While Russian researchers have a lot of experience in radio astronomy, this was a false alarm. Their PowerPoint presentation got more hype that it deserved within the SETI community. General interest media interpreted the report as a major breakthrough. Astronomers say that despite their disappointment about this particular signal, it’s an exciting time to do SETI. Higher power telescopes have confirmed that planets like ours are more common than previously thought. "Virtually all stars have planets. That changed the game in a philosophical way in terms of search for life elsewhere in the galaxy. The only way we’ll find it is by looking," Siemion said. So why pursue ET when the universe is so vast, and our telescopes only penetrate a small fraction of it? So far, we only know of one example of life, one kind of intelligence, one advanced civilization -- ours. "What keeps me going is the incredible awe and wonder at the presence of life in the universe whatsoever, the possibility that life might exist elsewhere," Siemion said. "It’s the most profound scientific question we can ask as human beings."